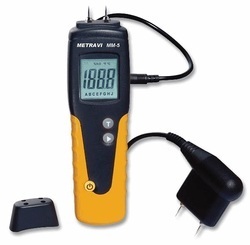 Prominent & Leading Wholesale Trader from Mumbai, we offer digital wood moisture meter, wood moisture tester, wood moisture meter kusam meco, wood moisture meter and wood moisture meter gann h 35. Model KM 963 Wood Moisture Meter Model KM 963 is used to measure the water content of wood, Bamboo, Veneers, Plywood, Pencil manufacturing units etc. Accuracy : ±1% rdg or F.S. Low battery symbol “ ”. Digital display : 3 digits. Material 2 : 7.1 ~ 80.0% (Soft wood such as Oak, Pine, Maple, Ash-tree, Douglas fir, Meranti and so on. For surveying buildings for dampness and for the rapid determination of the moisture content of wood/timber. Used the 2 pins electrode to measure the conductive ability of the species, then converter to the reading of % " Moisture of Content ". 9 material species groups in memory, calibrations for about 150 different species of wood are provided. Operating Temperature 0 to 50 ℃. Power Current Approx. DC 6.5 mA. Main instrument:180 x 72 x 32 mm ( 7.1 x 2.8 x 1.3 inch ). Moisture Probe: Round 23 mm Dia. x 165 mm. Round 0.9 inch Dia. x 6.5 inch. and small mills, the J-2000 helps to keep up with ever-changing job conditions. tool at a great value. · Bright, clear digital display. · Corrects for 48 individual wood species and temperature (°F and °C). · Averages up to 100 accumulated readings. · Moisture Range: 6%-40% on wood. · Integral contact pins mounted on top of meter provide 5/16” penetration. · Built-in connector accepts any Delmhorst electrode. · Size: 8” x 3” x 1 5/8”. · Rugged construction ensures years of reliable use. · Sturdy plastic carrying case. 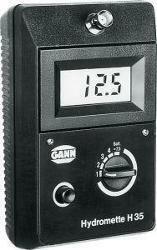 With Case: Includes meter, carrying case, and extra contact pins for the meter.Order as J-2000W/CS. extra 496 pins for the 26-ES electrode, and carrying case. Order as J-2000/PKG. 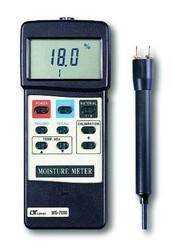 Handy quick moisture meter for fast single and series measurements. Size: L 140 mm × W 90 mm × H 42/50 mm. Weight: 220 g without accessory. Direct reading by digital LCD, resolution: 0.1% m.c. Wood species selector for automatic correction of readings, for over 300 species of wood. Fully automatic instrument setting – no manual adjustment necessary. Power supply by 9 V dry cell or, optionally, Ni-Cd accumulator. Measuring range H35 : 4-30% m.c. 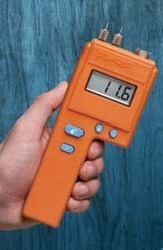 Looking for Wood Moisture Meter ?